Stainless steel is an iron-containing alloy—a substance made up of two or more chemical elements—used in a wide range of applications. It has excellent resistance to stain or rust due to its chromium content, usually from 12 to 20 percent of the alloy. There are more than 57 stainless steels recognized as standard alloys, in addition to many proprietary alloys produced by different stainless steel producers. These many types of steels are used in an almost endless number of applications and industries: bulk materials handling equipment, building exteriors and roofing, automobile components (exhaust, trim/decorative, engine, chassis, fasteners, tubing for fuel lines), chemical processing plants (scrubbers and heat exchangers), pulp and paper manufacturing, petroleum refining, water supply piping, consumer products, marine and shipbuilding, pollution control, sporting goods (snow skis), and transportation (rail cars), to name just a few. About 200,000 tons of nickel-containing stainless steel is used each year by the food processing industry in North America. It is used in a variety of food handling, storing, cooking, and serving equipment—from the beginning of the food collection process through to the end. Beverages such as milk, wine, beer, soft drinks and fruit juice are processed in stainless steel equipment. Stainless steel is also used in commercial cookers, pasteurizers, transfer bins, and other specialized equipment. Advantages include easy cleaning, good corrosion resistance, durability, economy, food flavor protection, and sanitary design. According to the U.S. Department of Commerce, 1992 shipments of all stainless steel totaled 1,514,222 tons. Stainless steels come in several types depending on their microstructure. Austenitic stainless steels contain at least 6 percent nickel and austenite—carbon-containing iron with a face-centered cubic structure—and have good corrosion resistance and high ductility (the ability of the material to bend without breaking). Ferritic stainless steels (ferrite has a body-centered cubic structure) have better resistance to stress corrosion than austenitic, but they are difficult to weld. Martensitic stainless steels contain iron having a needle-like structure. Duplex stainless steels, which generally contain equal amounts of ferrite and austenite, provide better resistance to pitting and crevice corrosion in most environments. They also have superior resistance to cracking due to chloride stress corrosion, and they are about twice as strong as the common austenitics. Therefore, duplex stainless steels are widely used in the chemical industry in refineries, gas-processing plants, pulp and paper plants, and sea water piping installations. Stainless steels are made of some of the basic elements found in the earth: iron ore, chromium, silicon, nickel, carbon, nitrogen, and manganese. Properties of the final alloy are tailored by varying the amounts of these elements. Nitrogen, for instance, improves tensile properties like ductility. It also improves corrosion resistance, which makes it valuable for use in duplex stainless steels. and then it is cast into solid form. After various forming steps, the steel is heat treated and then cleaned and polished to give it the desired finish. Next, it is packaged and sent to manufacturers, who weld and join the steel to produce the desired shapes. 1 The raw materials are first melted together in an electric furnace. This step usually requires 8 to 12 hours of intense heat. When the melting is finished, the molten steel is cast into semi-finished forms. These include blooms (rectangular shapes), billets (round or square shapes 1.5 inches or 3.8 centimeters in thickness), slabs, rods, and tube rounds. 2 Next, the semi-finished steel goes through forming operations, beginning with hot rolling, in which the steel is heated and passed through huge rolls. Blooms and billets are formed into bar and wire, while slabs are formed into plate, strip, and sheet. Bars are available in all grades and come in rounds, squares, octagons, or hexagons 0.25 inch (.63 centimeter) in size. Wire is usually available up to 0.5 inch (1.27 centimeters) in diameter or size. Plate is more than 0.1875 inch (.47 centimeter) thick and over 10 inches (25.4 centimeters) wide. Strip is less than 0.185 inch (.47 centimeter) thick and less than 24 inches (61 centimeters) wide. Sheet is less than 0.1875 (.47 centimeter) thick and more than 24 (61 centimeters) wide. 3 After the stainless steel is formed, most types must go through an annealing step. Annealing is a heat treatment in which the steel is heated and cooled under controlled conditions to relieve internal stresses and soften the metal. Some steels are heat treated for higher strength. However, such a heat treatment—also known as age hardening —requires careful control, for even small changes from the recommended temperature, time, or cooling rate can seriously affect the properties. Lower aging temperatures produce high strength with low fracture toughness, while higher-temperature aging produces a lower strength, tougher material. Though the heating rate to reach the aging temperature (900 to 1000 degrees Fahrenheit or 482 to 537 degrees Celsius) does not effect the properties, the cooling rate does. A post-aging quenching (rapid cooling) treatment can increase the toughness without a significant loss in strength. One such process involves water quenching the material in a 35-degree Fahrenheit (1.6-degree Celsius) ice-water bath for a minimum of two hours. The type of heat treatment depends on the type of steel; in other words, whether it is austenitic, ferritic, or martensitic. Austenitic steels are heated to above 1900 degrees Fahrenheit (1037 degrees Celsius) for a time depending on the thickness. Water quenching is used for thick sections, whereas air cooling or air blasting is used for thin sections. If cooled too slowly, carbide precipitation can occur. This buildup can be eliminated by thermal stabilization. In this method, the steel is held for several hours at 1500 to 1600 degrees Fahrenheit (815 to 871 degrees Celsius). Cleaning part surfaces of contaminants before heat treatment is sometimes also necessary to achieve proper heat treatment. 4 Annealing causes a scale or build-up to form on the steel. The scale can be removed using several processes. One of the most common methods, pickling, uses a nitric-hydrofluoric acid bath to descale the steel. In another method, electrocleaning, an electric current is applied to the surface using a cathode and phosphoric acid, and the scale is removed. The annealing and descaling steps occur at different stages depending on the type of steel being worked. Bar and wire, for instance, go through further forming steps (more hot rolling, forging, or extruding) after the initial hot rolling before being annealed and descaled. Sheet and strip, on the other hand, go through an initial annealing and descaling step immediately after hot rolling. After cold rolling (passing through rolls at a relatively low temperature), which produces a further reduction in thickness, sheet and strip are annealed and descaled again. A final cold rolling step then prepares the steel for final processing. 5 Cutting operations are usually necessary to obtain the desired blank shape or size to trim the part to final size. Mechanical cutting is accomplished by a variety of methods, including straight shearing using guillotine knives, circle shearing using circular knives horizontally and vertically positioned, sawing using high speed steel blades, blanking, and nibbling. Blanking uses metal punches and dies to punch out the shape by shearing. Nibbling is a process of cutting by blanking out a series of overlapping holes and is ideally suited for irregular shapes.Stainless steel can also be cut using flame cutting, which involves a flame-fired torch using oxygen and propane in conjunction with iron powder. This method is clean and fast. Another cutting method is known as plasma jet cutting, in which an ionized gas column in conjunction with an electric arc through a small orifice makes the cut. The gas produces extremely high temperatures to melt the metal. The initial steel shapes—blooms, billets, slabs, etc.—are hot rolled into bar, wire, sheet, strip, and plate. Depending on the form, the steel then undergoes further rolling steps (both hot and cold rolling), heat treatment (annealing), descaling Ito remove buildup), and polishing to produce the finished stainless steel. The steel is then sent the end user. movement of a tumbling material against surfaces of parts, dry etching (sandblasting), wet etching using acid solutions, and surface dulling. The latter uses sandblasting, wire brushing, or pickling techniques. 7 After the stainless steel in its various forms are packed and shipped to the fabricator or end user, a variety of other processes are needed. Further shaping is accomplished using a variety of methods, such as roll forming, press forming, forging, press drawing, and extrusion. Additional heat treating (annealing), machining, and cleaning processes are also often required.There are a variety of methods for joining stainless steel, with welding being the most common. Fusion and resistance welding are the two basic methods generally used with many variations for both. In fusion welding, heat is provided by an electric arc struck between an electrode and the metal to be welded. In resistance welding, bonding is the result of heat and pressure. Heat is produced by the resistance to the flow of electric current through the parts to be welded, and pressure is applied by the electrodes. After parts are welded together, they must be cleaned around the joined area. 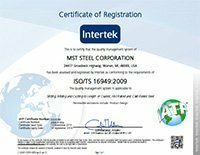 In addition to in-process control during manufacture and fabrication, stainless steels must meet specifications developed by the American Society for Testing and Materials (ASTM) with regard to mechanical properties such as toughness and corrosion resistance. Metallography can sometimes be correlated to corrosion tests to help monitor quality. Use of stainless and super stainless steels is expanding in a variety of markets. To meet the requirements of the new Clean Air Act, coal-fired power plants are installing stainless steel stack liners. Other new industrial applications include secondary heat exchangers for high-efficiency home furnaces, service-water piping in nuclear power plants, ballast tanks and fire-suppression systems for offshore drilling platforms, flexible pipe for oil and gas distribution systems, and heliostats for solar-energy plants. Environmental legislation is also forcing the petrochemical and refinery industries to recycle secondary cooling water in closed systems rather than simply discharge it. Reuse results in cooling water with elevated levels of chloride, resulting in pitting-corrosion problems. Duplex stainless steel tubing will play an increasingly important role in solving such industrial corrosion problems, since it costs less than other materials. Manufacturers are developing highly corrosion-resistant steels in respond to this demand. In the automotive industry, one steel manufacturer has estimated that stainless-steel usage per vehicle will increase from 55 to 66 pounds (25 to 30 kilograms) to more than 100 pounds (45 kilograms) by the turn of the century. New applications include metallic substrates for catalytic converters, air bag components, composite bumpers, fuel line and other fuel-system parts compatible with alternate fuels, brake lines, and long-life exhaust systems. With improvements in process technology, super austenitic stainless steels (with nitrogen contents up to 0.5 percent) are being developed. These steels are used in pulp-mill bleach plants, sea water and phosphoric-acid handling systems, scrubbers, offshore platforms, and other highly corrosive applications. A number of manufacturers have begun marketing such materials in sheet, plate, and other forms. Other new compositions are being developed: ferritic iron-base alloys containing 8 and 12 percent Cr for magnetic applications, and austenitic stainless with extra low sulfur content for parts used in the manufacture of semiconductors and pharmaceuticals. Research will continue to develop improved and unique materials. For instance, Japanese researchers have recently developed several. One is a corrosion-resistant stainless steel that displays the shape-memory effect. This type of material returns to its original shape upon heating after being plastically deformed. Potential applications include assembly components (pipe fittings, clips, fasteners, clamps), temperature sensing (circuit breakers and fire alarms), and springs. An improved martensitic stainless steel has also been developed for precision miniature and instrument rolling-contact bearings, which has reduced vibration levels, improved life expectancy, and better surface finish compared to conventional materials.